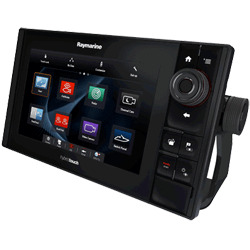 You are here: / Ads / NAVIGATION / E-NAVIGATION ---------------- / Raymarine --------- / Raymarine --------- MFD 9"
eS98 Multi-Function Display, MFG# E70275-NAG, with 9" LCD, Navionics+ U.S. Charts, CHIRP DownVision sonar, WiFi, internal GPS, and HybridTouch operation. Optional radar, night vision, AIS, video, autopilot, remote, Sat WX, and audio.